As you must plan the funeral or memorial of a loved one, you will soon realize the expenses can add up. However, while there is still time, proper planning can help you overcome this burden. While having final expense insurance can help cover most of the costs, you can still lower these expenses by implementing the following three options. The average casket costs anywhere from $2,000 – $3,000. This is the charge to expect walking into a funeral home and not price shopping. After you have added on the bells and whistles, the cost of a casket can easily skyrocket another thousand dollars. Funeral homes can also have significantly different prices for caskets. It always helps when making a big financial purchase to do some research and compare different funeral homes. You will also want to be aware of common sales tactics used at funeral homes to get you to spend more money. If interested check out How to Save Hundreds on Funeral Costs for more information. When you do settle on a funeral home, they are required to show you all of their available caskets, not just the ones on the main display floor. So be sure to see the ones they may have sitting in the basement – which are the least expensive options. The funeral home you use should not charge any additional fees for purchasing a different vendors casket. Do you know the difference between a burial vault and a grave liner? The vault is used to cover the entire casket as it is placed in the ground. A liner covers just the side and top of the casket. Grave liners are much cheaper than a burial vault. Burial vaults and liners are also available per a third party vendor. The cemetery expense can be just as costly as the actual funeral. The plot alone could cost you $1,500. Then, add on the endowment care, opening and closing, grave marker fees, and other expenses and you could be close to over $4,100 in cemetery fees. Ex-military are known to be eligible for a military burial. 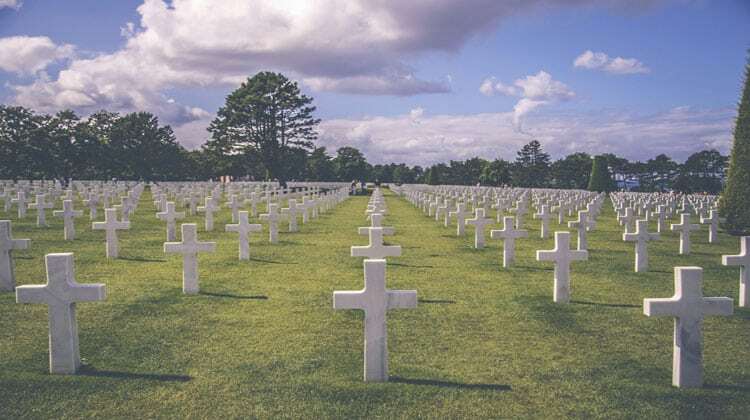 However, the U.S. Department of Veteran Affairs states that spouses, dependents, and parents may be entitled to be buried at a military cemetery as well. This could save you thousands of dollars. Complete the Application for Burial Benefits if you suspect your loved one is entitled to this benefit. Between a funeral and burial expenses, it can feel you are going to go over your head in debt to bury a loved one. However, combining final expense insurance and the above three tips will keep the expenses low and more affordable. Thanks for the information. My father passed away a few days ago, so now we’re planning a funeral. Like you said, I’d like to save as much money as possible, so I’m going to follow your tip about doing a lot of process before choosing a burial plot. Do you have any other tips especially for me? My sister just passed away and we can’t afford a traditional funeral. We’ve gone ahead with cremation instead, but I know my mom is really sad we didn’t get to do a full-scale funeral for her. I wish we could afford it. I think we are going to surprise mom by having some of the ashes put into handmade glass art. I’ve seen some really pretty colored orbs, with swirls of ashes inside, that look like small galaxies! Lexie would have loved that. Price shopping for your casket has to be probably be the best way to save money on burial funerals since they are just such a big expense. I’m glad the article mentioned the grave liner vs burial vault. I did not now their was a cost difference.